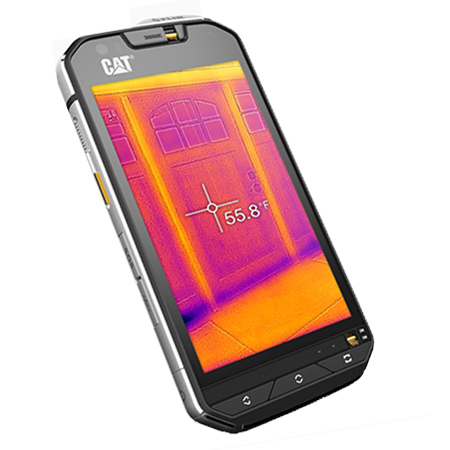 The CAT S60 features a 4.7 inch HD capacitive multi-touch display which can be controlled when wearing gloves or if your fingers happen to be wet. The display can be viewed in very bright sunlight and is protected with the latest Corning Gorilla Glass 4. With a strengthened die cast frame, the robust CAT S60 exceeds military specifications and is built to withstand drops from up to 1.8 metres onto a concrete floor. The device is also dustproof and waterproof to depths of up to 5 metres for up to one hour, meaning it could easily be used as an underwater camera. The CAT S60 runs the latest Android Marshmallow software and is powered by a Qualcomm Snapdragon octa-core processor. There’s 32GB of storage and 3GB RAM together with a dual-SIM slot which can be used for work and a personal phone. The device also boasts a microSD card slot for memory expansion up to 128GB, together with a non-removable 3800mAh battery. 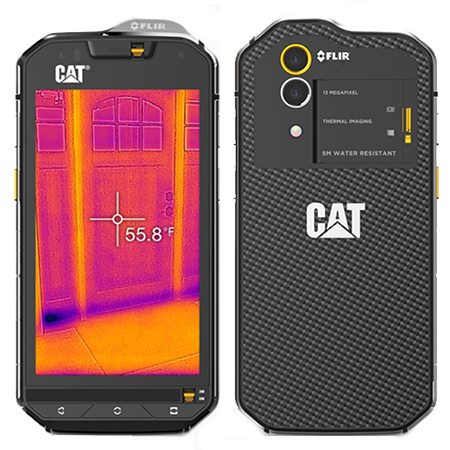 Sittting just above the 13 megapixel regular camera is the integrated thermal imaging camera which can detect heat loss from doors and windows, missing insulation and over-heating electrical appliances. It also allows you to see in complete darkness as well as taking thermal videos and images. The device also has a 5 megapixel front facing selfie camera.